Russell Eponym delights on a lovely spring afternoon at The Magic Tree – Ce Soir Arts – Be inspired tonight! He shared some beautiful music from a lilting Irish songstress Cara Dillon – and it was delightful. Her light, airy, and spot-on vocals charmed us all. Then, of course, Russell had a lovely thought for the day; always meaningful, he seems to “hit the spot” most every time, to provide a note of interest and encouragement. The remainder of the hour was filled to the brim with literature and poetry that soothes and yet enraptures the soul. Almost always offering an eclectic mix of prose and verse, Russell engages us with his deft vocalisations and clear readings. That he graced us with two of his own musical compositions was icing on the cake – always sweet and thought-provoking, the hour sped by in excellent company. Do come round to enjoy the work of this singular artist at Ce Soir Arts. 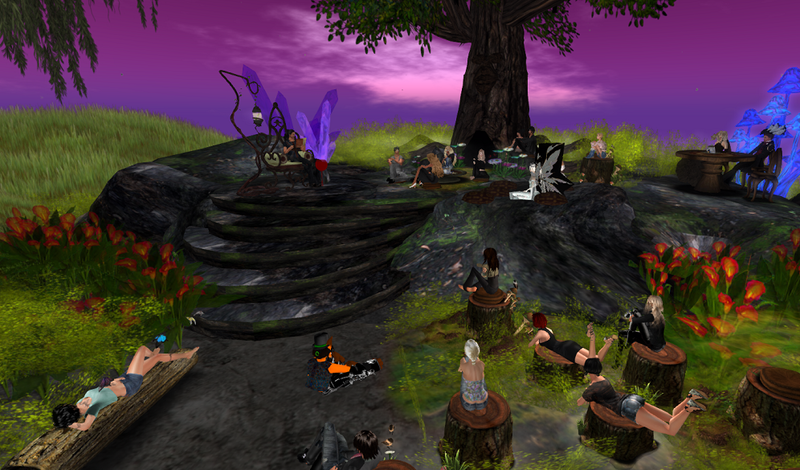 Russell reads each Tuesday at NOON SLT at The Magic Tree. We gather round in this little forested area and relax into what is always a most enjoyable hour. Russell also joins us on Thursdays in Chateau Ce Soir for 90 minutes of toe-tapping music that charms and delights. From sweet ballads to snappy tunes that will tickle your funnybone, talented musician Russell Eponym has them all! Everyone is welcome to join us for 90 minutes of dancing, smiling, and warm banter. Do come along! Previous Another Intriguing Monday Meme!